Last month two of our project workers attended the International Permaculture Convergence (IPC) in London. It meant at least a week off work, but we knew it would be worth it to grab a load of inspiration and ideas to bring back to our fledgling LAND centre. Permaculture enthusiasts from 6 continents were in attendance, sharing amazing stories of their projects and the challenges they encounter in their particular climates and societies. On offer each day were an almost overwhelming range of workshops, on topics as diverse as drought proofing in the desert, working with goats, and mapping your zone 00 (self!). Participants could go to a certain tent if they wanted to stick with a particular theme, or mix and match with sessions on all aspects of Earth Care, People Care and Fair Shares. We also took the opportunity to volunteer and develop our skills and confidence with different types of group. As part of the ‘Next Big Step’ conversations, Luke facilitated a discussion amongst international researchers, who went on to plan the first ever international permaculture journal. Meanwhile Naomi joined the crew as a ‘Neighbourhood Coordinator’ – helping the communal lodges to run smoothly and hosting morning circle meetings for over 100 happy campers. Amongst all this we still found time to network with people from near and far; discussing a Yorkshire Permaculture Network, as well as building new connections and comparing notes with kindred spirits from the other side of the world. It was amazing be amongst so many people dedicated to making positive change, and we’ve certainly learned a lot to bring back to our projects here in Leeds. Who knows yet whether we’ll make it to the next IPC in India… It’s a long way to travel, but perhaps the HP Source bike trailer will fancy a road trip! The Killingbeck fruits and flowers project will hopefully commence in February 2016. 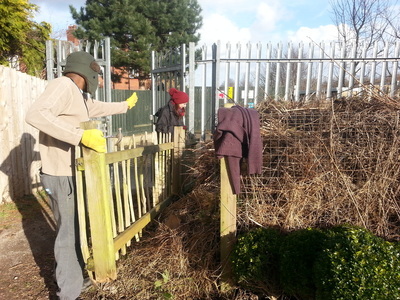 Spring boarding from the community allotment project that has grown over the last 2 years. 5 residents have teamed up with Environmental charity Hyde Park Source and Affinity Sutton to form a Fruits and Flowers team. They have secured 105 wild harvest hedge row trees to edge the old allotment site (currently kept locked up with nothing but grass in it). The group has also been selected to flagship a Britain in Blossom urban orchard, one of 6 across Leeds. The orchard will be designed as permaculture food forest and will not only be self-maintaining but will eliminate the grass cutting costs! 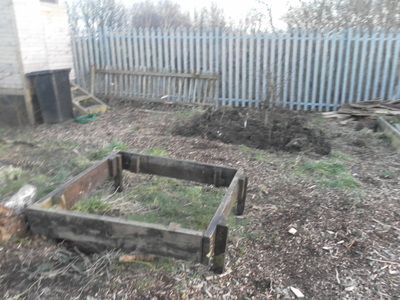 While this is being established the allotment will be kitted out with a kitchen and propagation shelter. This will facilitate all weather sessions with the 30 children we work with each year to process fresh fruits and vegetables into juices Jams and healthy meals grown by their own hand. Integrated into the south facing side of the structure will be a propagation green house. Linda and Jean (Killingbeck Green Inspectors) have designed this aspect to increase their flower growing capacity working with the kids. They have volunteered to facilitate weekly flower growing sessions with the kids. Brightening the estate from seeds planted and nurtured by the kids! Planting the trees and sowing the seeds begin this November and will grow for years to come. Here at Hyde Park Source we've been plotting an exciting new project. 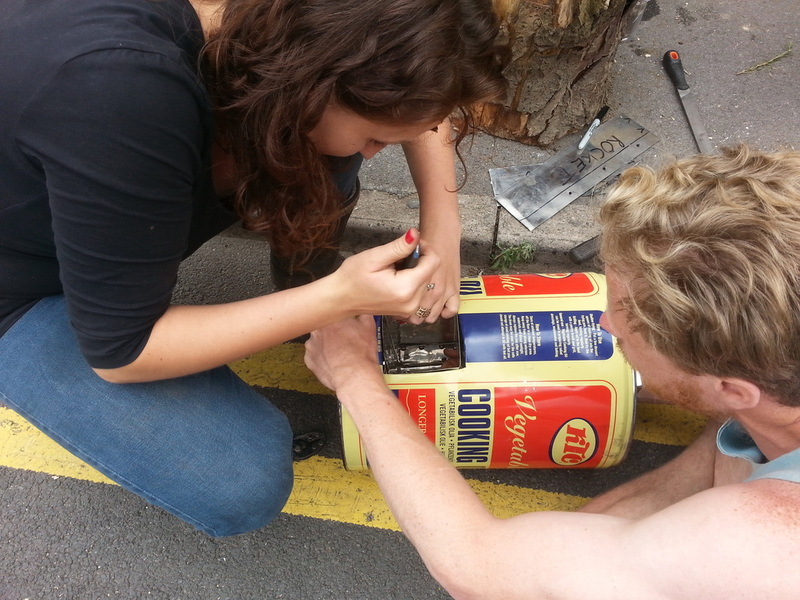 We want to set up England’s first tool library right here in Hyde Park! Over the years we've often had requests from other organisations, our volunteers and friends to borrow or use the tools in our workshop. It’s clear that if we are going to be able to help people out, we need to develop a fair and formal process, so after a bit of research we decided the model of a tool library fits the bill! This would be an amazing community resource, inviting local people to become members and borrow tools to complete their own projects. We’d also like to run workshops and help people share their skills with each other – to improve confidence and skill with particular tools. This is just an idea at the moment, and we’d like to know your thoughts on it! 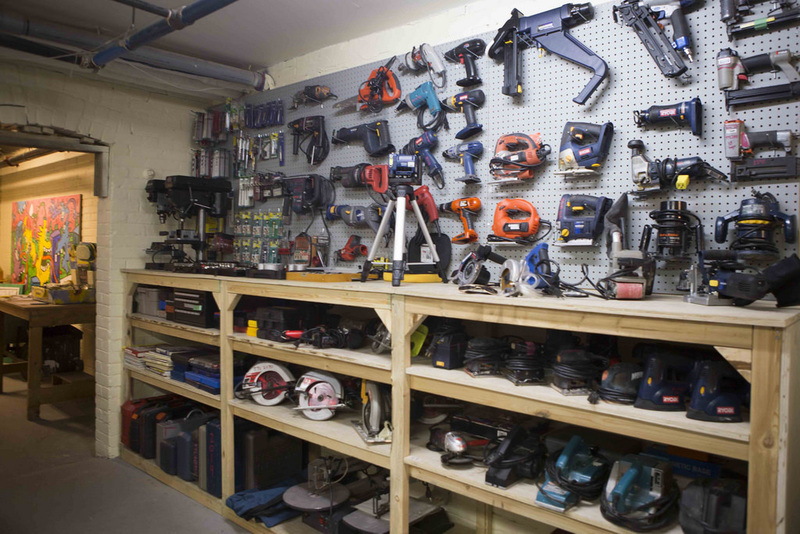 Would you use a tool library? Would you donate tools to it? Could you show people how to safely use a tool? Do you have access to all the tools you need anyway? Please fill out our survey and help us develop the tool library dream into a reality! 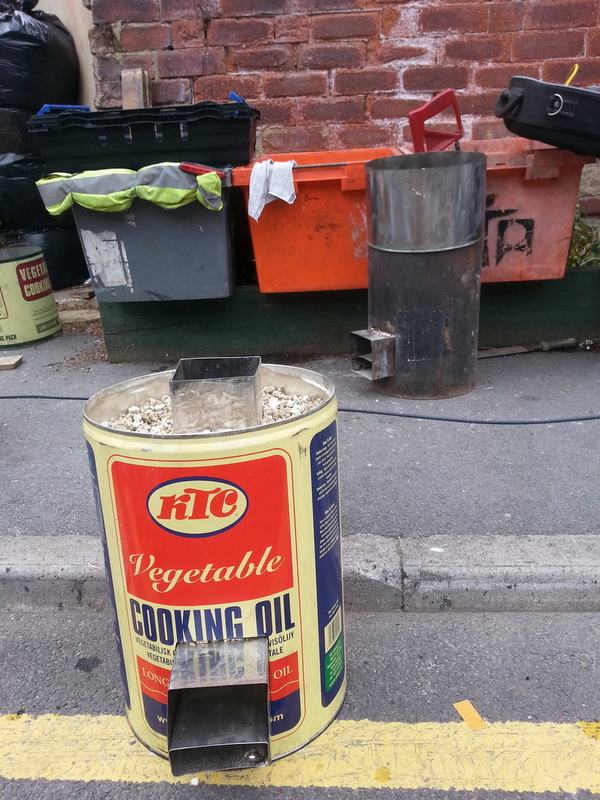 We are a really big fan of rocket stoves at Hyde Park Source. Made from recycled oil cans and stainless steel from the scrap yard these are low impact pieces of kit. We had a really interesting day workshop with Ben Milner who through much trial and error has designed this stove. Working out in the sunshine we cut the tops of the cans off, folded flat metal into square tubes and bolted it together, nibbled holes in the cans and wiggled the flue into position and finally filled it up with Perlite. With the fire insulated and well ventilated these stoves achieve a very clean burn perfect for cooking with little smoke. We use ours almost weekly in summer for jam making juicing, cooking and brewing tea. A big thanks to Ben for the workshop and the people that came to help build them. Watch out for the possible bike trailer building workshop hopefully coming up with Ben. It's been great to take the time to celebrate with all the children, adults, groups and partners we have been working alongside so far this year. We've had the Rosebank Summer Gala and Woodhouse Ridge Festival - both very successful and made so by YOU! Special Thanks to all the volunteers who helped out at these events. 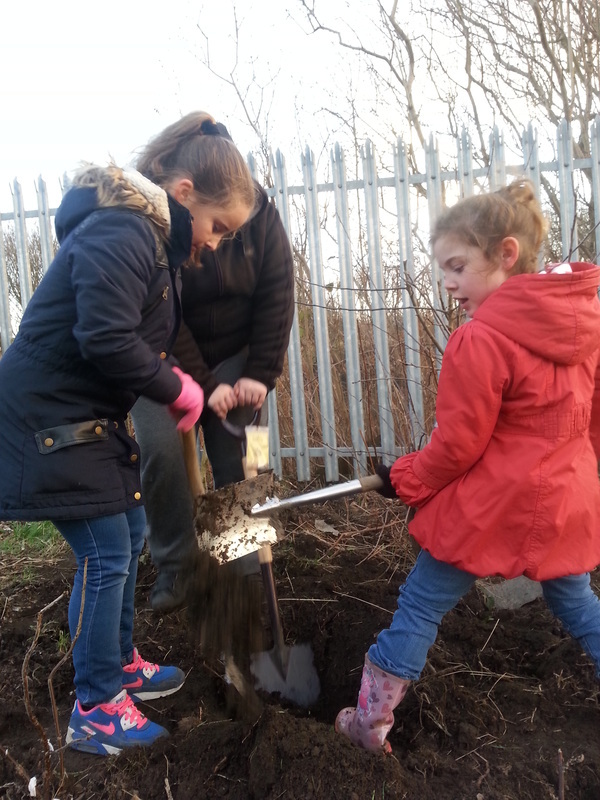 New afterschool Rangers club in Bramley! 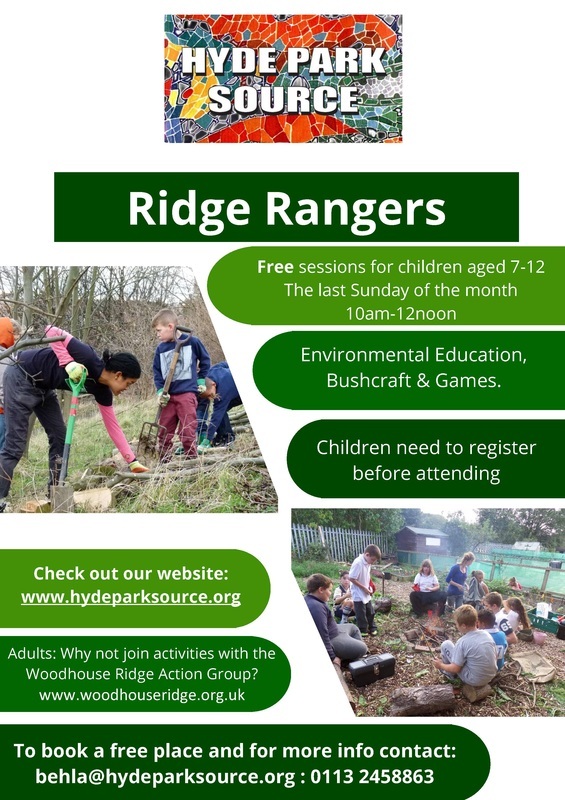 Hyde Park Source have started another fantastic project; an after-school Rangers club in Bramley working with Leeds and Yorkshire Housing Association. 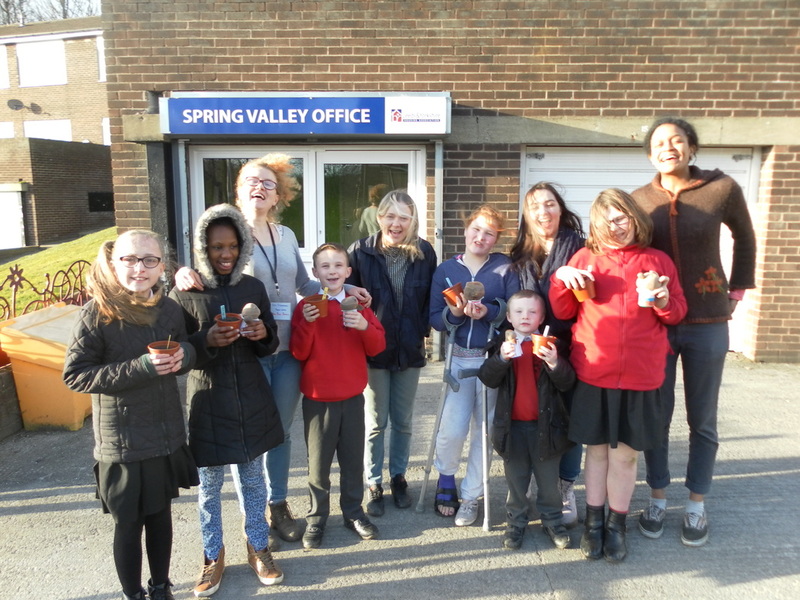 Six weeks in and the Spring Valley Rangers have been busy planting fruit bushes, testing soil, sowing seeds, printing with leaves, and playing lots of games! They had a very successful Easter Action Day; everyone got stuck in and built a raised bed and a living willow fence. Its our new project worker Rita's first group, she says "I feel very luck to have such a fantastic group of Rangers! I can't wait to see the group grow, and see the difference we're going to make at Spring Valley." 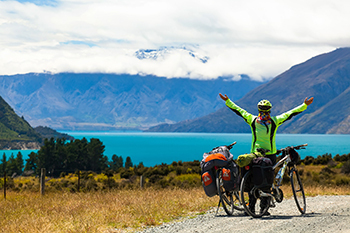 Wendy's End-to-End Big Bike Challenge! Wendy, our wonderful treasurer, is about to cycle from John O'Groats to Land's End, visiting and learning about some fantastic eco-communities and permaculture projects on the way. She's also fundraising for Hyde Park Source, so if you'd like to sponsor her and raise some money for us click here. We'll be using any funds generated for renovating our building. THANK YOU AND GOOD LUCK WENDY! We have been turning the soil for a new season at Killingbeck as well as Cracking on with other winter jobs like maintaining the compost bays, finding firewood and building raised beds. 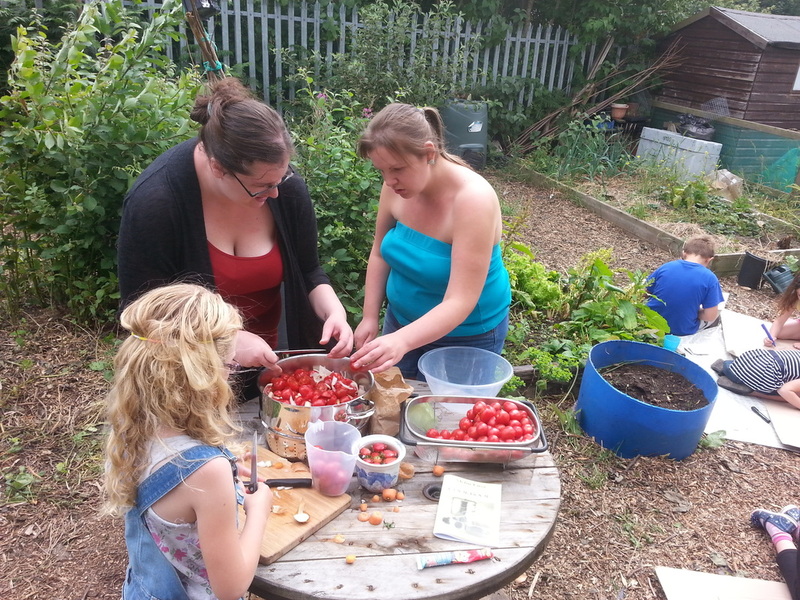 New people are getting involved it was great to work with Vicky who is doing horticulture training through Homebase and Amanda who is keen to come along with her two kids next time. Rosebank Saturday- come on down!